Affordable housing in Fort Worth could get bulldozed by the �need� for high-dollar digs. Two years later, the apartment board kicked them out after the man Gutierrez had married and whose name she put on the lease of her apartment drove home drunk one night and hit several cars in the parking lot. Gutierrez was a model example of someone striving to get out of public housing. After moving to Stonegate, she had become the first displaced Ripley Arnold tenant to complete a self-sufficiency program. She had found a good job and was saving money to buy her own home. Gutierrez appealed her eviction, saying that the apartment board hadn�t produced evidence of complaints within the complex. She admitted that her husband had a drinking problem but said he no longer lived there and was in therapy. She even told the apartment board she was willing to divorce him if only she could stay at Stonegate for a few more months, until she could make it on her own. The apartment board and the Fort Worth Housing Authority were unmoved. Gutierrez said the legal-aid lawyer who examined her case told her it wasn�t high priority and he was busy. 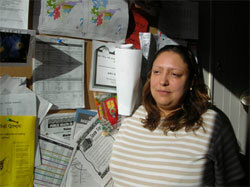 The eviction cost Gutierrez a chance to qualify for a Habitat for Humanity home. Now she is about to buy a home in a Northside neighborhood that scares her, but it�s all she can afford. �The housing authority doesn�t care about us,� she said. As part of the agreement negotiated by Dallas civil rights attorney Mike Daniel, the mostly minority residents from Ripley Arnold were promised permanent housing in mixed-income neighborhoods � that is, mostly middle-class white communities. They were also promised support programs to help them attain self-sufficiency. 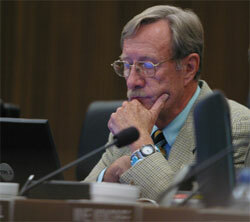 At the meeting where the deal was announced, then-Mayor Kenneth Barr called the agreement unprecedented. Ramona Utti, who had emerged as the leader of the Ripley Arnold residents, told them, �We have been heard,� to a chorus of cheers. The housing authority disputed the claim, saying that only 25 were evictions � 16 for drugs or other criminal offenses, eight for nonpayment of rent, and one for housekeeping violations � and that the other 68 moved voluntarily. Complaints against housing authorities are nothing new. People surviving on government assistance are struggling in their lives and tend to hurl frustration at the agencies they deal with. Affordable housing is a volatile endeavor across the country, and universal agreement among tenants, neighbors, politicians, the business community, and housing officials is rare. A growing disparity between stagnant salaries and rising home costs is making it harder to afford a house. Tightening the noose further is a Bush administration intent on cutting housing benefits � the president�s proposed budget for 2006 could result in the U. S. Department of Housing and Urban Development losing a quarter of its $31 billion budget. So far, Congress has opposed the majority of these cuts. Fort Worth compares favorably to other Texas cities in how it addresses affordable housing � although some might say that�s akin to being at the top of a very small hill. The city deserves some of the venom cast its way. The Fort Worth Housing Authority was involved in selling the Ripley Arnold public housing project to RadioShack, which then tore down 268 apartment units, killed a popular subway system, closed a free parking lot that serviced thousands of downtown motorists, and has avoided paying millions of dollars of property taxes on the land for three years. 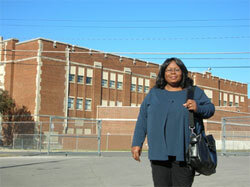 Meanwhile, many former Ripley Arnold residents are still waiting for permanent housing. A housing authority report states that more than 3,200 families are on housing assistance waiting lists (more than twice that amount were on waiting lists in April 2003 when the authority stopped adding names to the list, to give officials time to catch up). �The Fort Worth Housing Authority has a kind of status quo policy, where they say �We�re not as bad as the other housing authorities, so we must be OK,�� said Deb Kroupa, a housing advocate with United Housing Program, a nonprofit that builds affordable homes. Then there�s the city housing department and its not-for-profit offshoot, the Fort Worth Housing Finance Corp., which quietly bought land for an upscale retirement center against the neighborhood�s wishes. The same bunch is also accused of mismanaging money for a housing project on Evans Avenue and of sponsoring a $236,000 Woodhaven redevelopment plan that could remove several apartment complexes that currently provide affordable living to mostly minority tenants � despite the fact that one of the greatest demands in the city is for affordable rental housing. Only about 13 percent of rental units are affordable to extremely low-income households earning 30 percent of the median income or less. That means about 18,500 renter households are competing for 11,800 affordable units. Meanwhile, city leaders are seeking to boost tax rolls by passing stricter residential building guidelines that would increase new home costs and make it more difficult for blue-collar families to own. A city study claimed that workforce homes weren�t generating enough property taxes to pay for the city services they require. At the same time, the city has been dishing out tax abatements like hard candy on Halloween to large corporations and giving incentives to developers to build luxury condos and residences, especially in the downtown area. �That�s about as snobbish and elitist as you get,� said city councilman Clyde Picht. The red-brick Ripley Arnold apartments that for decades provided downtown public housing for poor families were torn down in a matter of weeks after the city and housing authority reached an agreement with the tenants and completed the sale. Negotiations had been sometimes tense, but tenants were impressed that the city and the housing authority bellied up to the bargaining table, listened, and offered tenants concessions such as moving expenses, computers, social services, and legal aid. 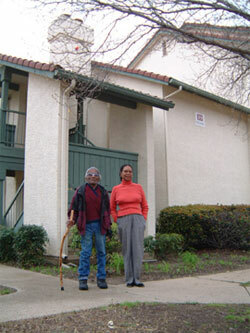 Utti, who lives at Stonegate, continues to represent former tenants of Ripley Arnold. She also serves on the Fort Worth Housing Authority�s board of commissioners. The mayor appoints the five-member commission, and the law requires that a public housing resident fill one position. HUD sets guidelines and provides funding for the agency�s operation, which includes overseeing 1,225 public housing units and two mixed-income properties � Overton Park Townhomes and Stonegate Villas � that were partially funded through proceeds from the sale of Ripley Arnold to RadioShack for $20 million. Utti says public housing in Fort Worth is better than in many cities and that she is �really enthused about working together with the Housing Authority.� Still, serving on the commission hasn�t much curbed her tongue. She has asked the housing authority for office space within apartment complexes, where residents can have easy access to support services such as day care, job training, and tutoring. �We all have problems with transportation,� she said. Take Eulice Butler, for example. The 78-year-old had lived at Ripley Arnold for 20 years, where he says he never missed a month of rent. Butler suffers from chronic back pain and lost a leg when a car hit him at age 7. Butler, who now uses a scooter to get around, said he didn�t think he would have a problem paying rent at his new apartment at Stonegate. He planned to supplement his Social Security check by shining neighbors� shoes. One day when he got on the bus so he could go to the housing authority�s offices downtown, the bus damaged his scooter. Bo McCarver runs a nonprofit organization working with low-income housing residents in Austin. 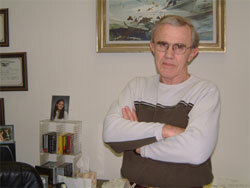 He has been following the Ripley Arnold tenants and said that so far the move hasn�t worked for them. �The residents say they feel safer than at Ripley Arnold, but they have no sense of community,� he said. At Ripley Arnold the residents had a centralized location with easy access to good schools, jobs, and daycare, but that is no longer the case � a situation that public housing advocates predicted at the time. Utti becomes visibly emotional when she talks about how hard some of the residents must work to afford their new apartments. As part of the agreement, residents pay no more for their apartments than they did at Ripley Arnold, but many are still having trouble paying rent and bills and putting food on the table. A stroll through the complex reveals that some tenants place plastic over their windows rather than turning on the heat, to reduce utility bills. In many cases, the former Ripley Arnold tenants feel they are under constant scrutiny at their new apartment complex, which public housing residents share with urban professionals and college students. The evictions also trouble Utti. She called the Housing Authority�s figure of 25 evictions �suspect,� noting that if the other tenants left under favorable circumstances their stories would be publicized. Cheryl Quiroga, who headed the residents� association at the Butler Place public housing apartments just east of downtown, was recently evicted. Quiroga�s daughter, Tina, lived with her father most of the time, but in the summers she stayed with her mother at Butler. The housing authority discovered Tina had been working when she was with her father and considered it as unreported income on Quiroga�s part, even though Tina wasn�t on the lease. Quiroga said she tried explaining this to housing authority officials to no avail. She said that cases like hers and Ruby Gutierrez� are common in public housing. When Quiroga lived at Butler, she was ticketed for trash that other people left in her yard at night, resulting in a 30-day eviction notice, she said. In the end, she was evicted for her daughter�s unreported income. She said that after being kicked out of Butler, she lived out of her car until she found a cheap duplex to rent in the Polytechnic neighborhood. The duplex was broken into through the roof, and the burglars �stole everything, and I mean everything,� she said. After becoming the first of the displaced Ripley Arnold residents to complete a self-sufficiency program, Gutierrez found a job with the city health department, where she has been working for two years. Prior to being evicted from Stonegate, Gutierrez was close to moving out of public housing and into a Habitat for Humanity home, but her application was denied once she was evicted. Habitat for Humanity policy requires applicants to have established a permanent address for a year before they qualify for a home. Now Gutierrez is planning to buy a house on the North Side. In the meantime she is living with her husband, whom she didn�t divorce, and her daughters in a rented house. McCarver said residents are under constant scrutiny at their new apartments. Meanwhile, the city still hasn�t found permanent replacement housing for the 268 units that were lost at Ripley Arnold. According to the housing authority�s web site, as of November, 159 permanent public housing apartments had been provided three years after the original agreement, leaving 109 temporary apartments still needing to be replaced by permanent ones. The temporary apartments are mostly located in neighborhoods that don�t fit the city�s definition of mixed-income and racially diverse. Daniel said the evictions of residents shouldn�t be happening. Instead, he said, a city that made idealistic promises to quell disquiet isn�t living up to the bargain now that RadioShack is finished and Ripley Arnold tenants are out of sight and mind. McCarver said that the housing authority will not try hard to find permanent apartments for Ripley Arnold residents as long as homeowners in the areas fight them. Daniel is not ruling out legal action against the city, but he said he has to wait until the neglect of tenants reaches a point where courts can�t ignore it any longer. Housing authority executive director Barbara Holston said critics are exaggerating not only the number of evictions, but the overall scope of the problems faced by former Ripley Arnold tenants. She is aware that a letter was sent to Mayor Mike Moncrief asking for an investigation into the 93 alleged evictions and canceled leases, but isn�t aware of any current investigations by the city or by HUD. She said she welcomes any scrutiny. A HUD official said the agency is not investigating the housing authority. Contrary to the opinion of Utti, Daniel, and others, Holston said many support services are provided on site to public housing tenants. Job training and child care require travel, but free transportation is usually available to access them, she said. Utti wants an on-site office at the apartment complexes where tenants can go to find out about services. The business of providing affordable housing is fraught with perplexities that frequently create damned-if-you-do, damned-if-you-don�t scenarios. For instance, tenants appreciate rules that govern behavior at public housing sites and yet complain when people such as Gutierrez and Quiroga are kicked out for breaking those rules. That�s the same argument offered by President Bush, who is seeking to cut about $1.5 billion from federal housing assistance because programs aren�t leading to self-sufficiency. He has pushed for faith-based initiatives since being elected five years ago. When it was pointed out to Utti that she was espousing ideologies almost identical to what Bush has been pushing, she seemed surprised. �I hate to think I�m agreeing with the president,� she said, citing his eagerness to cut benefits. The nonprofit organization run by Utti, the Trinity Valley Pioneers Community Development Corporation, is funded by a Catholic charity. Despite their transgressions, city leaders and housing officials have hardly turned a blind eye to supplying housing assistance. In 2003, Fort Worth was ranked as the most affordable housing market of all Texas� major cities, according to the Real Estate Center at Texas A&M University. The city�s median income is about $60,300 a year for a family of four, meaning 66 percent of Fort Worth households could qualify to buy a home, compared to 53 percent of households nationally. The city�s median house price of $95,700 is below the state level of about $125,000, and well below Dallas� median house price of $138,900. In recent years the city has spent more than $6 million in assembling land and building more than 100 affordable single-family homes; issued $9.7 million in tax exempt mortgage revenue bonds to develop a 160-unit senior development; provided almost $3 million in federal subsidies to help 350 lower-income households become first-time homeowners; and recently approved $3.2 million to help redevelop the Riverside Village Apartments into 232 single-family homes. The help is needed since statistics from HUD and the city show there are thousands more low-income households than there are affordable apartments and homes available. About half of the city�s housing stock was built prior to 1970, which means older homes are available � often in need of repairs but also with cheaper sales prices. Fort Worth also wants to keep its wealthier residents and is making efforts to attract developers of upscale housing. Indeed, according to Fort Worth�s master plan, high-end housing is in shorter supply than affordable housing. Only a third of the city�s houses cost more than $120,000 � the second-lowest percentage among the state�s six largest cities. People seeking high-end homes are more likely to migrate to the suburbs, while people seeking affordable housing are more likely to stay. For several years, Arlington has found itself in a similar battle to stiffen housing guidelines, making it more expensive to build a house, generating more property taxes, and encouraging big spenders to stay in town. Arlington city leaders have been accused by some of elitism and applauded by others for trying to boost taxes and shoo away poor folks. Critics blast those efforts as exclusionary, even though high-end housing ultimately generates more taxes, which in turn compensates to some degree for the lower taxes generated by more affordable housing. While the city is seeking to maintain a diverse housing stock, few will dispute that affordable apartments and houses continue to be in short supply. Neighborhood residents voted against the project at a public hearing attended by Haskin, who agreed to curtail the project. Yet later she encouraged Walker to buy the land and hold it until public opinion changed. Walker is in perhaps a peculiar situation � heading the housing department for a city that wants to increase the cost of homes and also overseeing the nonprofit Fort Worth Housing Finance Corporation, which was created to finance the cost of residential ownership for people of low and moderate income. Walker�s attempt to finance an upscale retirement village was seen as an insult by affordable housing advocates. Mayor Moncrief�s response to the letter from the Ripley Arnold alumni � or other questions raised by this story � is unknown since he didn�t return phone calls requesting comment. City council members Wendy Davis, Ralph McCloud, Haskin, and John Stevenson also did not respond to requests for comments. City housing Director Jerome Walker said the White Lake property that was purchased by the housing department�s finance corporation is being held for future development opportunity, although the city �has no plans to serve as developer of this site,� he said. Walker�s department has also been involved in another overpayment controversy involving affordable housing, this one on the neighborhood revitalization project along Evans Avenue. In 1998, the city council designated 15 acres as a special economic development zone called the Evans & Rosedale Business and Cultural District. A community advisory committee and the city�s planning department developed a $14 million, three-year plan, funded mostly by federal grants and loans, to revitalize the area. Tax breaks were offered to residential developers and businesses willing to invest in the area. Now more than half the money is gone, yet progress has been minimal, and federal officials have accused the city of mismanagement and wasting hundreds of thousands of dollars by overpaying for property � including overpayments that padded the pocket of the real estate agent hired to oversee purchases. The project is still waiting for new businesses to come to the neighborhood, and HUD is investigating. �HUD is continuing to work with the city of Fort Worth in resolving whatever findings or problems had been isolated as a part of one of our operational reviews,� said HUD spokesman Steve Brewer. A HUD audit estimated that $1.2 million may have been mismanaged. The city disagrees with that assessment and is responding to HUD�s concerns. �That may be what they ask for, but we�re trying to clear all that up and I think we are going to clear all that up,� said Assistant City Manager Dale Fisseler. The city has consulted with Washington D.C. attorneys who specialize in responding to HUD audits. Meanwhile, the housing department, housing authority, nonprofit organizations, grassroots community groups, and others continue the seemingly never-ending mission of providing affordable residences that are within grasp of the city�s large number of struggling families.